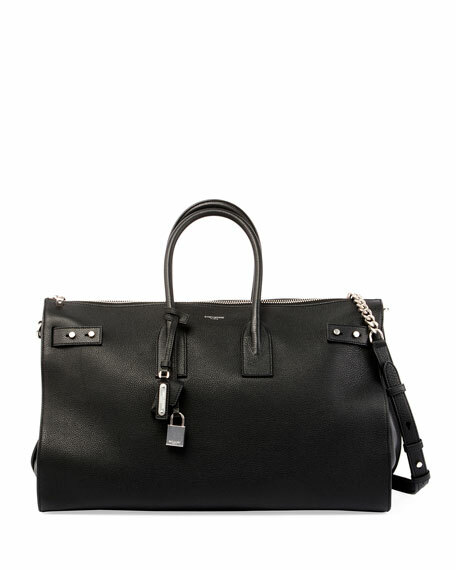 Saint Laurent grained calfskin duffel bag with silvertone hardware. Two rolled top handles with hanging padlock and logo tag. Removable, adjustable chain/leather shoulder strap. Belted top secures by tabs at front. Embossed logo at center front. 11"H x 14.6"W x 5.1"D.
"Sac de Jour" is made in Italy. Balenciaga extra small triangle duffel bag in calfskin leather. Can be carried in hand or over shoulder. Rolled top handles. Balenciaga extra small triangle duffel bag in calfskin leather. Can be carried in hand or over shoulder. Rolled top handles. Removable, adjustable shoulder strap. Two-way zip-around closure. Embossed logo at bottom. 11"H x 6.3"W x 2.6"D. Made in Italy. Duffle bag with "I've Got Abs They're Multiplin'" text at front. From the Grease?? Collection. Flat top handles. Zip closure. Duffle bag with "I've Got Abs They're Multiplin'" text at front. From the Grease?? Collection. Flat top handles. Zip closure. 20"W x 9.25"T. Imported.